The co-organiser of the dinner is reported to have stepped down from his role as non-executive director at the Department for Education over the allegations. THE PRESIDENTS CLUB has said it will close down after an investigation by The Financial Times claimed that women were harassed and “groped” at the black tie male-only President Club Charity Dinner last week. The group said this evening that “the trustees have decided that the Presidents Club will not host any further fundraising events”. Any remaining funds held by the trust will be distributed to children’s charities and “it will then be closed”. On 18 January, the annual event that raises millions of pounds for children’s charities, including Great Ormond Street Hospital, was hosted at Mayfair’s Dorchester Hotel. The male-only event was attended by 360 figures from British business, politics, finance and the entertainment industries. Two reporters for The Financial Times went undercover and joined 130 other specially-hired hostesses for the evening. The two reporters and other hostesses at the event have revealed accounts of being subject to harassment, groping and other inappropriate behaviour from the event’s attendees. Sky News is also reporting that the co-organiser of the Presidents Club dinner, David Mellet, is to step down from his role as non-executive director at the UK’s Department for Education in the wake of the allegations. Earlier, Great Ormond Street Hospital said it would return its previous donations from the Presidents Club. We are shocked to hear of the behaviour reported at the Presidents Club Charitable Trust fundraising dinner. We would never knowingly accept donations raised in this way. “We have had no involvement in the organisation of this event, nor attended and we were never due to receive any money from this event. All monies raised in our name go to support vital work. However, due to the wholly unacceptable nature of the event we are returning previous donations and will no longer accept gifts from the Presidents Club Charitable Trust. The night began by the women being paraded in front of the men, before having to attend to tables and mingle with the attendees. Hostesses reported men repeatedly putting hands up their skirts; one told the newspaper that one man exposed himself to her during the night. According to the report, multiple women working at the event also witnessed groping and similar abuse across many of the tables in the room. Another woman, with experience of hostess work, told The Financial Times that this event was “significantly different” to previous black tie events. She reported being repeatedly fondled on her bottom, hips, stomach and legs. One guest attempted to kiss her, while another invited her upstairs to his room. The event, which has been running for over 30 years, was this year hosted by comedian and children’s author David Walliams. He has not, however, been subject to any allegations. The hostesses were reportedly hired by Artista, an agency specialising in hosts and hostesses for what it claims to be some of the “UK’s most prestigious occasions”. After initial interviews, the agency reported told the women that the men in attendance might be “annoying” to try to get hostesses “pissed”. Artista told The Financial Times: “This is a really important charity fundraising event that has been running for 33 years and raises huge amounts of money for disadvantaged and underprivileged children’s charities. 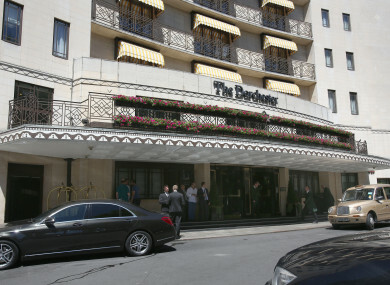 In a statement to the paper, the Dorchester said it has a zero-tolerance policy regarding harassment of guests and employees. “We are unaware of any allegations and should we be contacted we will work with the relevant authorities as necessary,” it said. The Presidents Club recently hosted its annual dinner, raising several million pounds for disadvantaged children. The organisers are appalled by the allegations of bad behaviour at the event asserted by The Financial Times reporters. Such behaviour is unacceptable. The allegations will be investigated fully and promptly and appropriate action taken. Email “The Presidents Club to close down following sexual harassment claims”. Feedback on “The Presidents Club to close down following sexual harassment claims”.